The DVD division of the BBC. The official BBC site for all things related to Doctor Who. 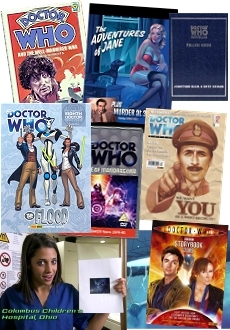 Publishers of the record breaking Doctor Who magazine and of the annual Doctor Who hardback Story Books. Publishers of genre novels, including horror and science fiction, and of non fiction books. Bafta award winning special effects studio specialising in high quality models and miniature work for film and television. BBC One regional magazine programme. The premier sci-fi, fantasy horror and cult TV magazine. If you're interested in my work, want to commission an illustration or just send me some comments, I'd love to hear from you.